Possible peak demand situations during functions and sporting events etc. A survey of the building was then carried out and the layout, dimensions and current plumbing was recorded. 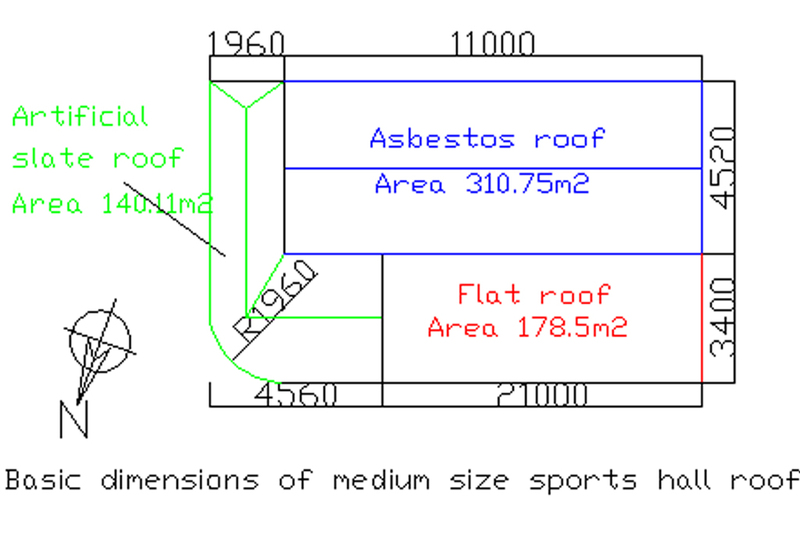 The roof areas were examined to assess their suitability and it was found that the largest part of the roof was constructed from corrugated asbestos and therefore not suited for rainwater harvesting. The newest part of the building uses artificial slates and offered the best source of clean rainwater, the remainder of the roof being asphalt and stone covered flat concrete construction at a lower level. On the ground floor all potable requirements are fed directly from the mains. 3 ladies’, 1 men’s, 1 disabled toilet and 1 latrine could use non potable water and are currently fed from a 1000 litre tank located on the flat roof above the toilet area. On the first floor all potable requirements are fed from the booster pump system except the kitchen tap which is fed from the mains. 2 ladies’, 2 men’s toilets and 1 washing machine could use non potable water, the connections to these are accessible from the attic and require minimal plumbing to separate them from the potable system. It was noted that the storage tanks in the attic could be a potential source of Legionella and should be insulated to prevent warming above 20 degrees, the incoming cold water supply should maintain a safe temperature if insulated but these tanks should be drained if left unused for any long periods. Likewise the tank on the roof above the toilets is unshielded from the sun and poses similar risks, if this tank is to be retained then similar measures should be considered. This figure is expected to vary considerably from season to season but no other bills were available. Currently this water costs 1.1 cents / litre plus standing charges so potentially a saving of almost 10 cents per flush could be achieved by switching to rainwater. It should be noted that considerable reductions in the volume of water required for toilet flushing could be achieved by simply reducing the internal volume of the cisterns and switching off the latrine flushes when the building is unoccupied. The section of artificial slate roof over the newer part of the building can be used to provide the rainwater required with minimal alteration. The guttering to this roof will need to be altered by changing the direction of fall toward the flat roof and the existing down pipes removed or fitted with diverters to allow for excess conditions. Tanks to accommodate at least 6000 litres of rainwater are to be fitted on top of the flat roof near the higher part of the building where acceptable supporting walls will provide the necessary load bearing. A booster pump will be mounted in a housing adjacent to these tanks and a float switch controlled connection will be made to the existing water supply to cater for times of low rainfall. This pump will serve the connections on the first floor via a pipe to the attic taken through the soffit near the tanks. 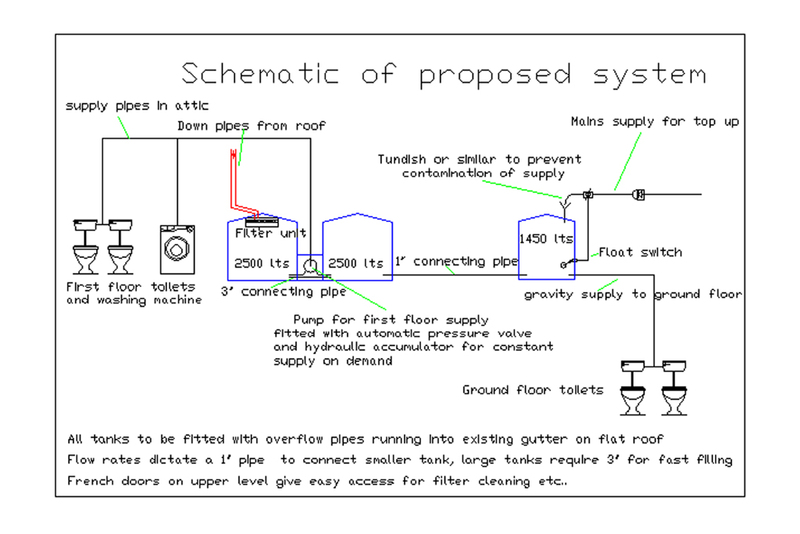 Water will be provided to the ground floor toilets via a connection to the existing gravity fed plumbing from the current roof tank, the feed from this being diverted to the float switch controlled top up facility on the new tanks. The tanks will be on the North face of the upper part of the building which should provide good shade and reduce the risk of unwanted algae or bacterial growth. Existing pipework and electrical connections will be utilised to save on cost and disturbance where possible and no structural alterations are required to the building. It is proposed that three tanks should be used, two 2500 litre circular tanks and one 1450 litre circular tank. The two larger tanks would sit close to the corner where the roof being harvested meets the older building. This allows for the filter unit to be fed directly from the gutter connections and makes for very short pipework. The booster pump would sit next to these and connect to the first floor plumbing. 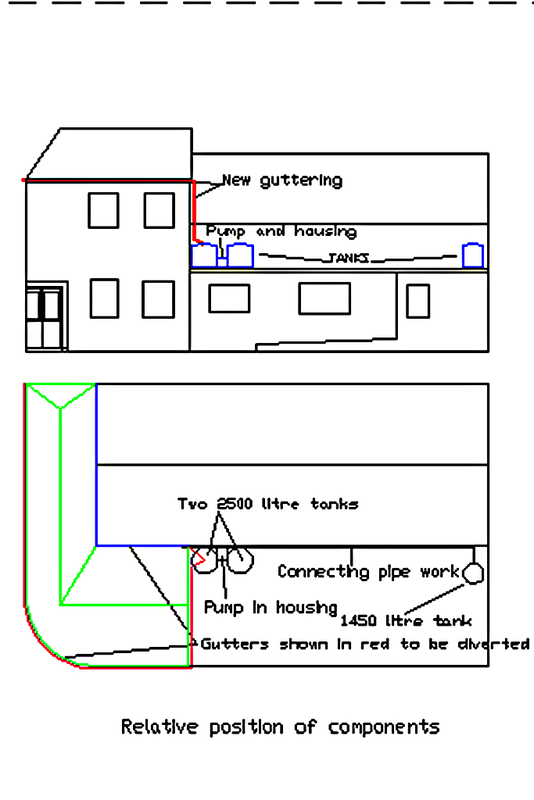 The third, smaller tank would replace the existing roof tank and be connected to the others via a one inch insulated pipe. Connections to the ground floor would come from this tank and the top up facility would be installed at this point also. These proposed costs are accurate at the time of writing and are based on items currently available in the region. Although there are no obvious problems relating to planning it would be wise to check with the local authority before proceeding with any works of this kind. The total outlay may seem prohibitive but the savings in direct charges for water may be more significant with the proposed increases in water rates. The particular uses of this building mean that a very large proportion of the water demand need not be potable making this an attractive candidate for rainwater harvesting. The reduced impact on the carbon footprint and the ability to ‘future-proof’ this building with respect to new ‘green’ legislation regarding water usage combined with actual financial savings still make this a choice worth considering. Although some issues have been addressed in this survey it must be noted that a full risk assessment should be carried out on the whole project and that measures should be implemented to correct known problems whether or not the rainwater harvesting scheme is pursued. Tagged commercial, rainwater harvesting. Bookmark the permalink.